The Spring 2016 issue of Innovations in Materials Research, the biannual newsletter of the OSU Institute for Materials Research, is now available online! The Fall 2015 issue of Innovations in Materials Research, the biannual newsletter of the OSU Institute for Materials Research, is now available online! The Fall 2013 issue of Innovations in Materials Research is now available online! Innovations in Materials Research is IMR’s newsletter (formerly IMR Quarterly). The Institute for Materials Research publishes a newsletter twice a year with technical articles highlighting OSU research, updates on research funded by IMR grants, facility updates, recently awarded grants, and other materials research news. To receive the newsletter by mail or to make suggestions for future articles please contact Layla Manganaro at manganaro.4@osu.edu. The Spring 2013 issue of Innovations in Materials Research, IMR’s newsletter, is now available! Innovations in Materials Research is IMR’s newsletter (formerly IMR Quarterly). 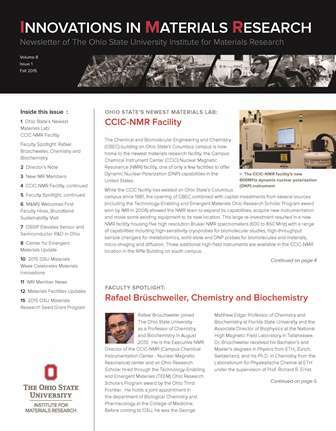 The Institute for Materials Research provides a newsletter twice a year with technical articles highlighting OSU research, updates on research funded by IMR grants, facility updates, recently awarded grants, and other materials research news. To receive the newsletter by mail, or to make suggestions for future articles please contact Layla Manganaro at manganaro.4@osu.edu. This summer Katrina Cornish joined The Ohio State University faculty at OARDC-Wooster as an Endowed Chair in Bio-based Emergent Materials. This key position is one of three Ohio Research Scholars at OSU founded by an Ohio Department of Development Ohio Research Scholars Program award, Technology-Enabling and Emergent Materials, with IMR Director Steven Ringel as the Principal Investigator. Dr. Cornish is an expert in alternative natural rubber production, properties and products, and on natural rubber biosynthesis in general. Her research focuses on bioemergent materials including exploitation of opportunity feedstocks from agriculture and food processing wastes for value-added products and biofuels. Dr. Cornish will hold a joint appointment with the Department of Horticulture and Crop Science and the Department of Food, Agricultural and Biological Engineering. In her new position, Cornish will lead a multidisciplinary team in the creation of innovative industrial materials from plant-based sources and associated biological, chemical and physical processes. She will also be charged with training new scientists and engineers for the emerging global bio-based economy. She will be based on the Wooster campus of the Ohio Agricultural Research and Development Center (OARDC) – which is the research arm of CFAES and the largest university agricultural bioscience research facility in the United States. The author of 145 scientific articles and patents, Cornish has also provided leadership for the development of new crop varieties, processing innovations, industrial and regulatory regulations and standards, clinical trials, and the creation of novel materials from hypoallergenic medical devices to termite-resistant building materials to biofuels. She has overseen several extramural research agreements with academia and the federal government in the United States, the European Union, Australia and southeast Asia. Dr. Cornish worked with the US Department of Agriculture at its Western Regional Research Center in California from 1989 -2004, first as a Lead Scientist and later as the Acting Research Leader of the Crop Improvement and Utilization Unit. Prior to joining OSU, she served as the Senior Vice President of Research and Development of Yulex Corporation. Her inventions at USDA were licensed by Yulex and form the foundation of the US domestic rubber industry by commercializing rubber and other industrial products made from guayule, a plant native to the southwestern United States. At Yulex, Dr. Cornish oversaw the company’s ongoing research, development, production, validation and regulatory programs for the commercialization of guayule latex for safe medical devices and specialty consumer products, including extramural programs. Natural rubber is a fascinating material – an elastomer unmatched by synthetic materials. We have shown that rubber is made by different plant species using essentially the same biochemical process but with species-specific differences that can be exploited commercially. For example, the rubber polymerizing enzyme in guayule (a desert shrub) is most active in the winter time, making large amounts of high quality, high molecular weight polymer. In the summertime, the rubber enzyme is a poor competitor for the monomer, which is essential for for plant growth and development. However, the enzyme uniquely inhibits the rubber polymer chain transfer reaction over a wide range of initiator concentrations – so once a new molecule is initiated, it stays in the active site and slowly grows to full length (see Figure 1). Without this property, guayule would make short, poor quality polymers in the summer and not make uniformly high quality rubber. We have also found that magnesium ions, an essential cofactor, act as an activator. Rubber biosynthetic rate is very sensitive to magnesium concentration. The affinity of the enzyme for the monomer can increase up to 100X with only a 2X increase in magnesium with a concommittant increase in production rate. Regulation of the concentrations of substrates and cofactor can produce polymers unknown in nature, such as molecular weight 50X higher than the normal high quality one million g/mol. Not only do the biochemical catalysts behave differently but the resultant rubber may perform differently indicating different market segments should be targeted (see Figure 2). Natural rubber outforms synthetic materials, but guayule rubber is softer and stretchier than even Hevea natural rubber, making it an ideal material for gloves and balloons. My research program is all about taking basic research to applied and then through the development and commercialization processes. We proved that guayule rubber does not contain any of the proteins involved in life-threatening Type I latex allergy and then scaled up the process. After overcoming a large number of commercialization barriers, guayule latex rubber now forms the base of the US domestic rubber industry in the south western states. We are working now to develop and commercialize rubber from the Russian Dandelion, a new crop plant for Ohio and to profitably use all parts of the plant. I am very interested in converting the inulin coproduced with the rubber into a butadiene – replacing an essential building block of petroleum-based synthetic polymers with a biobased, but identical, version. For more information on Dr. Cornish‘s research e-mail at cornish.19@osu.edu.